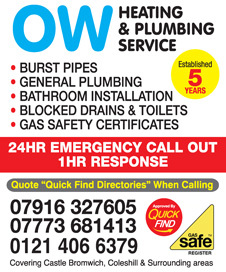 OW Heating & Plumbing Service provide all aspects of general plumbing work in Castle Bromwich, Erdington, Coleshill, Marston Green and surrounding areas. Vetted and approved by Quick find directories and Gas safe registered. "Used O & W today to replace a water heater. This is the second time we have used them and I they are great. Prompt, reliable and not as expensive as the other guys. Told me ahead of time what the price would be and that is what it was. They even cleaned up after themselves!" "What a great company ! Reliable & on time. Diagnosed my plumbing issue fast & also a very reasonable price. I love a local family owned business like this one ! Highly recommend them for any of your plumbing needs ."